Thank you for your support in the fight against breast cancer. Please complete the following information to process your online donation. All transactions conducted on this web site are encrypted using a secure server to protect your privacy. 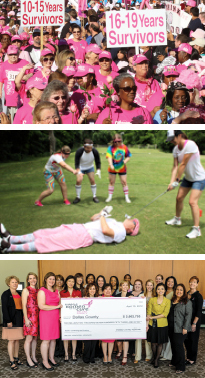 When an In Honor or In Memory gift is received, Susan G. Komen Dallas County will promptly send a personalized tribute card to the person or family indicated, notifying them of your thoughtful donation but not revealing the amount of the donation. Every gift is tax-deductible and the donor receives an acknowledgement for the donation.